Words spoken or read bring up memories. Today this word was spoken. Portnanteau is heavy drapes used to keep rooms warm and closed in open doorways. The memory is of heavy dark tapestry panels between the front hallway and the livingroom in my father’s house. I remember them open most of the time. The stairway and the drapes made a game for my two brothers. I was the moving part of the game. These two panels pulled across a round wooden pole spanning the opening on round, wooden rings. While closed, my brothers sat on the first landing or a step, positioned me on their raised feet. They took turns. Then with a quick push, I flew into the portmaneau, grasping them to break my fall. I do not know at what speed I flew across the hall. My first flying lessons required no previous training. Occasionally, my stepmother or other female would caution us. You boys stop that! Your sister will get hurt! You children go outside and play! You will break the pole. We never played that game if Daddy was home. But what slowed the boys down was when the wooden rings began to break. At first there were extras in a drawer. Finally, the drapes were drooping noticeably. I suspect that I was also getting too large to propel me. At any rate, the games changed. If I remember correctly it was one of several things I got sent to my room for and stopped the fun when all of the rings broke, leaving the fabric in heaps on the floor. At breakfast, I overheard a Boston couple talking with a Canadian. One said the Casino is cheaper in the afternoons. Yesterday a man decided to spend only $2.50 each day in the machines. putting a quarter in each one. At one point the machine he had just fed paid off for $50. To someone else. Then someone played roulette and won $50,000 – but that could just be a rumor. Since we got a late start and missed the catamaran, we go to a gallery in a clothing store. I wanted to see “Paintings by Mr. Amos Ferguson” (primitives). Bought gifts for the girls and Lorraine’s baby, Keelan. Tonight we have early dinner reservations for the Bahamian Club and Le Cabaret on Friday. John wished for Stevie at the B. Club. We go around Paradise Island to Cottage Beach. It is a part of Britannia Beach. The boat is driven right up on the sand. We stay there an hour: swimming, snorkeling, drinking fresh coconut juice are available. We realize we got a lot of sun and have not bought anything for Al. Shops were closed at noon on Thursdays. At McDonald’s we talked with a woman who looked like Trina and worked in a bank. She was critical of the market people as they are ‘not well educated.’ She said that accounted for their dialect. I told her about the argument we heard and she said “They were expressing themselves well.” There is a song which says Bahamian marriages don’t last long. We learned about the island of Eleuthra where a house can be rented on the beach. She said it is very beautiful and that the sands are pink in the sunset. 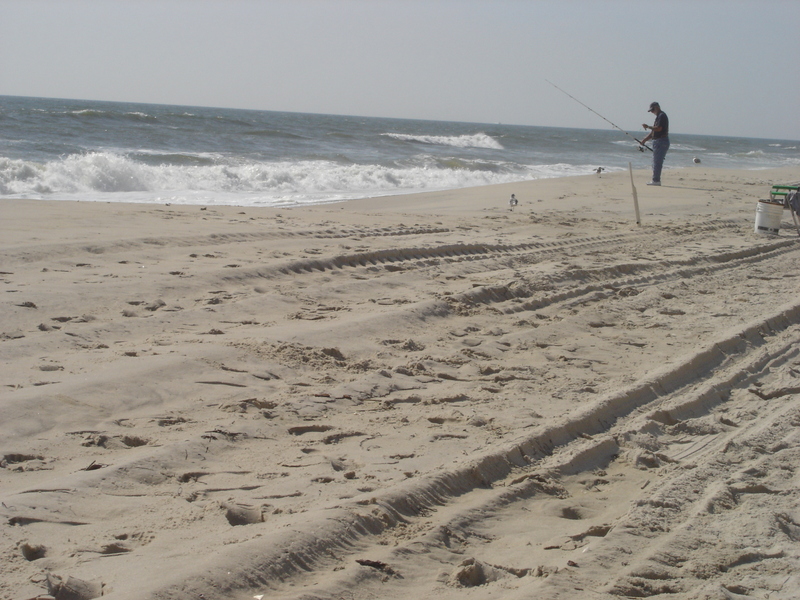 The natives use Sanders and Nassau beaches. I wanted to go to another art gallery in Lyford Cay. It was written up in the newspaper. Perhaps tomorrow. Our only trip to Martha’s Vineyard was the week Elvis died and Kennedy got in all that trouble. One morning I went to the historic gingerbread houses built by the Methodists. John and the children rented a catamaran. I carried water, an apple and a pilot pen to use on parchment paper. These houses ring a large open area that had a stage in the middle. Chairs had been set up for the concert being held that evening. The grand piano, Steinway surely, was being played by the evening soloist, who went through the program. No one else was there! I drew these houses in a pointillism method while the soloist played just for me. Unreal. I was in such euphoria when I arrived back at our place. Only to learn that a plane had swooped down into the water near their catamaran. They had pulled the plane to a dock. And then, they realized that the key ring had fallen into the water. Gone keys to car, house etc. tt took an hour and help to fish them out of the water and return to a safe shelter. I still can not believe they saved a plane. Your beautiful book just arrived. I cannot wait to read and share it. You took an idea from beginning to book in all the right ways. You included me in getting involved so that I have followed all the ways you used the media so effectively. Who knew that you would use Kickstarter and get the money needed to publish the book? And will we see more from your publishing company? It has been my pleasure to meet you through wordpress.com. I wish you further success. It did not pass my keen eye that you included a handwritten note. Thanks to you! Each year we get two special days to review our lives and to make changes: New Year’s Day and your birthday. My recent celebration reminds me of when Mr. Stockdale asked Why am I here? My question was What have I still to do? The answer is a long list of things to finish and things to begin. Two years ago on New Year’s Day, I realized my research notes and art works were in no condition to be understood by anyone. Not even my co-researcher daughter who collaborated with me on genealogy. Not even my artist friends. And so I made organization a priority. Ha, how am I doing? Not as well as I had hoped. I have reasons and excuses. First, my priority changed. Maybe veered. The body took the top of the list. It has taken two full years to get my body in line with my mind. Aging makes the need for balance in both walking and thinking. I am happy to say that I understand what makes me more productive and am fortunate to free up my schedule for work. And for me, work is fun! 1…to acknowledge what I have accomplished. My studio work continues to impress and challenge. More subjects for my Women Series are discovered often, and I have started the writing needed. (biographical and marketing). I am studying and producing work in new (to me) media including encaustic. 2…to finish what I start. WordPress followers are my daily routine. i have my favorites, but all provide nuggets for a curious mind. I reblog or comment often even if my posts are neglected. And so time has to be set aside for any and all online commitments. I have signed up for a few that I have no idea how they work. And unfortunately the ‘improvements’ often do not work for me. Oh, to have some of the older apps! 3…with each work in process, find a place for it. Plastic storage helps me see what I am working on. Clear my workspaces at least at the end of the week. I like to leave the next week’s work laid out with notes. When I come in, I will be ready to start. Group supplies and tools near the workspace where they will be used. Make notes on where things are to save hours of searching. 4…personal time is work time. If you are not healthy and sleep sufficiently, you can not have needed balance. People who work for themselves cannot remember where the time went. When I worked for the Girl Scouts of Chicago, my daily schedule was kept in three blocks. We worked so many nights, in meetings or training, that we tried to leave blocks open to prevent unnecessary overtime. When this was not possible, I had the time for school activities or sick children. I could take time off for vacations or me-time. Now I must remember to give myself permission to work or not. We should not feel guilty about making time for friends and shopping! Soon the next day for evaluation will come and I will see how I am doing. The next few months will give you time for assessing what you need in your life for happiness. Shout out to bloggers I have learned from on WordPress and other sites. Sue Healy is an accomplished writer who shares her successes and disapointments. Recently she wrote about ideas that come from news items. It made me think about the sources of inspiration that remain on my List(s) Of Things To Do. Those ideas get moved from list to list. Lists serve as reminders and guilty feelings. Sue suggests ways to alter news information to make it your own. Visual artists can use photographs etc. as source material. Always respect copyrights, real or implied. Make your own vision and style. This post made me think that ideas are just a start. The writer who does not write produces thoughts. He or she (me) must do the work to bring thoughts to life. You may not wish to fail. But who will know your vision? I tell myself, “Don’t count yourself out.” Publishing, exhibiting or sales are not the only judgements of worth. It is the doing that should satisfy. A woman blogger, booksbyjudith, is working many angles to produce and share her talent. She writes books in series. This trend is based on an idea that if you read one, you are likely to read others. Like television series: you make time for the characters if you like them. What nuggets started me on various Women Series? The large women started using square canvases. The idea: What poses do women use in their work? Can you fill the canvas with the image. The Women Who helped Desegregate Transportation came from Sojourner, by Nell Painter. 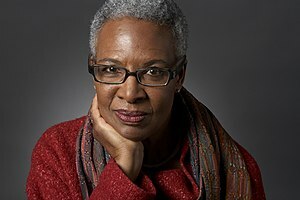 In it she describes scenes of conflict Sojourner Truth had on trolleys in D.C. I was reminded of similar experiences. The current series Women Who Dressed as Men may never be completed. Each month research suggests more interesting subjects. The idea began when online searches turned up Deborah Sampson as a subject to paint. In 10 years in MA, I had never heard of her! Try not to get lost in idea-farming if you want to write, paint, photograph etc. Balance thought with completed works. When you have done your best, date, sign and share. Start a new project knowing that you are continuing to learn. In time your body of work will stand on its own, and may inspire others. In a cartoon, there would be a lady in easy chair surrounded by books, computer or iPad, clock, mug and, of course, words and images swirling around her head. To make it morning-lost, perhaps curlers or scarf on hair, house coat etc. Swirling about my head are terms evoking memories. How have I recorded past memories? My uncle purchased 52 acres more or less with his war pension. It had hills, he said. My diary drawing of hills gave no indication of a future career as an artist. Two knockdown. Writer! Artist! Through the years more memories were started on envelopes and yellow pads. Sketch books have text additions according to my mood. 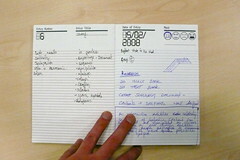 Travel journals include outfits, activities and menus beside pen and ink drawings. As I approached 80, journals became more important. I prefer blank paper to add sketches and paste programs etc. The first many were spiral books with colorful covers bought at art stores or online. Small books with black paper are used for gel pen abstract drawings. Each has a thought or poem added. Now I am using Moleskin thin books for writing and those with Japanese folded paper for sketching. My friend, who keeps her writing well-organized, gave me a beautiful book to combine my interests. It is a jill bliss Butterfly Fields Eco-Journal published by Chronicle Books in San Francisco. 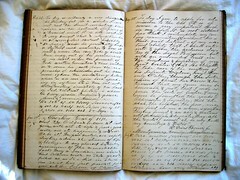 Journalling, recording audio and video as well as blogging will provide the materials for historians. Usually one family member becomes the keeper of secrets. I hope our online posts will be mechanically retrievable but if not, handwriting on archival paper will preserve the memories we wish to share.